Founded by Dan Beard in 1910, Troop 1 of Flushing, New York is believed to be one of the oldest continuously chartered Boy Scout Troop in the United States. For over 100 Years, we strive to provide youths with the skills, knowledge, and self esteem that will help them find success in all walks of life. Troop Camping Trip - TMR! ​Meet at Bay Terrace Parking Lot Friday night at 7:30PM. Please click HERE for a complete list of our events! WE ARE ON AMAZON SMILE! 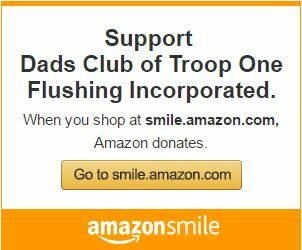 You can now show your support for Troop 1 by selecting us as your Organization of choice on Amazon Smile! Amazon will donate an amount equivalent to 0.5% of your purchases from Amazon Smile to our Troop to help continue our program for the youths. Please Click Here or the image below to start your support today!